The Youth in Landscapes Initiative unites young innovators (aged 18 – 35) to develop real-world solutions to land use challenges in partnership with organisations working on the ground. How can we generate and use data more effectively to drive better land restoration processes in shared river basins? The solution that the Landscape Restoration Team proposed for the 2015 Youth in Landscape Challenge is Land, an open-access toolkit with both online and offline functions that puts local people at the heart of landscape restoration. Land will initially focus on the highlands of Ethiopia, where the Blue Nile starts, as degraded lands here have both significant impacts on local communities and knock-on effects for the millions of people living downstream. Millions of hectares are planned for restoration in the next years in accordance with the Bonn challenge, but to effectively restore the Nile basin qualitative and quantitative data is needed to inform adaptive management. Land meets an important need by providing real-time data to organizations, particularly those with existing restoration projects based in the highlands. Land is a people-centred toolkit that encompasses many features with the potential for expansion overtime. It includes a platform for gathering information in ways that local communities can contribute, an interactive social network, a discussion forum for those involved in agriculture, information for various users (local community users through to NGO or even policy users) and the means to manage events in local communities. The platform is designed to continuously gather and update existing data sourced from partners active in the highlands. This is accomplished by enabling people in local communities to provide indigenous knowledge and data on their local environments by providing a free app connected to the platform. This continuous cycle of real-time data will then be provided to organizations engaged in restoration projects and the local community to empower under-represented groups, gather gender disaggregated data and encourage sustainable solutions. Partners retain control over information fed into the system. Land is an important toolkit that provides critical information to those organizations and local people in a position to make a difference. In the Landscape Restoration Challenge, we are asking youth around the world to engage in defining innovative tools for socio-economic and environmental data development and use in order to enhance vital land restoration processes in two major African river basins – the Nile and Volta. Land restoration is essential to healthy ecosystems, continued land productivity and the mitigation of risks to communities caused by climate and other shocks. Land restoration in the Volta and Nile basins needs better data management and provision and enhanced ways of making data at scale something driven by people themselves – in effect a form of data ‘crowdsourcing’. 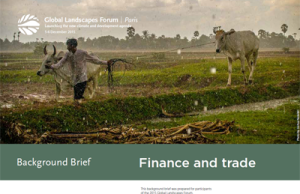 This will help build a better picture of the trends and stresses caused by human activity across landscapes and the entry points, incentives and other tools that can be used to help restore degraded landscapes and generate healthier ecosystems. Deeper understanding of local context and experiences will be important, but so will be innovations in sharing and uploading data from local to global (e.g. Google Earth) levels. The mission is to build on work established under the CGIAR Research Program on Water, Land and Ecosystems called the “Four Basin Gender Profiles” (4BGP project). This project has mapped socio-economic data using geographic information systems across shared river basins to reveal key patterns that tell us about gender and development issues driving change within basins. (2) develop ways of making the maps themselves more interactive and remotely ‘updateable’ through the actions of basin inhabitants themselves. Effectively interpreting data through maps adds huge decision making capacity – particularly in dealing with challenges at scale (such as within a shared river basin). It also provides a valuable educational tool for use across society and in the media to translate often difficult conceptual issues into understandable stories of change. We want youth to unleash their creativity and innovation across these basins to bring effective data provision and use into effective decision making and investment. How might we help people using landscapes and basins establish more effective mapping tools that decision makers can then use to target and measure land restoration investment? This may include a range of innovative app development processes that incentivise sharing of information at a ground level, to more effective establishment of GIS layers, dashboards and other data visualisation tools, as well as existing social media platforms. You decide how you will become data innovators! Become data innovators, bring your data skills and radical ideas, employ your powers of analysis and interpretation and help in the development of the people and ecosystems of two of Africa’s largest shared river basins. ALAN NICOL is a thought leader with over 20 years of professional experience at the cutting edge of resource management issues in the Horn of Africa, Middle East and Asia. He has brought social and political science analysis to a range of consulting, research for development and policy influencing activities, including establishing the Water Policy Programme at ODI in London, leading research on water and livelihoods in Ethiopia under the RiPPLE programme, developing water-smart agriculture as a concept and approach in East Africa and, most recently, heading up the Governance, Gender and Poverty Theme at IWMI. Alan has written and speaks widely on water resources development issues at all levels. He is a particularly strong advocate of trans boundary river basin cooperation as a key pathway to economic growth and transformation within shared landscapes.